A number of years ago I had a very keen birder who had only been birding for a number of months excitedly tell me had seen a Red-headed Weaver in the southern Freestate. I pointed out that this bird is severely out of range, but he was insistent that it was one and that it matched up to the only possible bird in the book. Expressing my doubts, I asked if the bird was still around. He confirmed that there were quite a number of them. The next day we set off to see the birds, and I could gently correct him to the correct species, which was in range and quite abundant. His is not a single case. When I started birding many years ago I also had instances where I convinced myself of a species, believing the range maps and/or the abundance descriptor is wrong. Many of these I removed from my lists as my skill grew, and I better understood the range maps and distribution of birds. But this is a difficult topic, as there is always that slight remote chance of finding an out of range bird. How do we understand range maps? Firstly in this day and age technology has much improved our accuracy of bird distribution. Citizen Science has enabled millions of bird distribution records to be collected and has allowed for updated distribution charts. The extract of one of the SABAP species maps above gives a good indication of the granularity of the data collected. 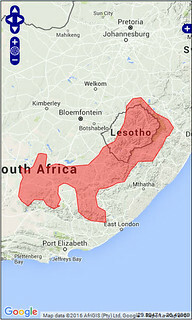 This is then smoothed out in the distribution maps we see in bird guides. 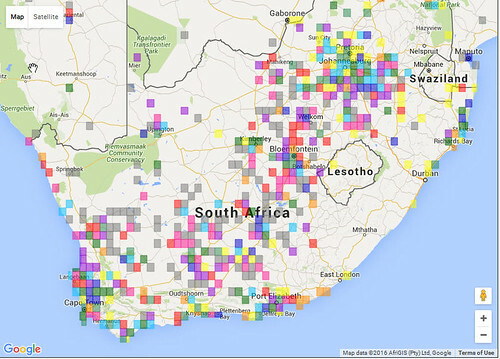 The data displayed in Sabap is based on current data going back to around 10 years. This is overlaid with historic data, which then also give an accurate view of population and distribution changes. What does this then mean for the beginner birder? Trust that map in your book. If a bird is on the border of its distribution then you can consider it but keepin mind that we are working with a 2cm map representing a country measuring around 2000km across. That 2mm that you are out of range on the map could represent a 100km on the ground. My advice is if the bird range is not covered by the area you are in, then have a hard look at your bird book for other alternatives, the chances are that it is something different. 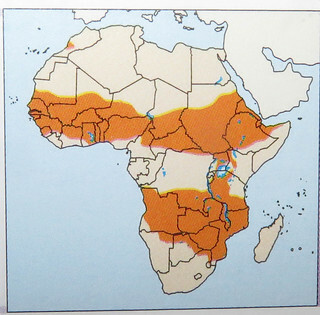 The distribution maps in the books usually have some form of shading or colour coding to indicate resident, breeding, migratory breeding and non breeding birds. Resident birds very rarely will be found outside of their range and therefore one should really double check if you find one out if it’s given area. With Migratory birds there is an increased possibility that birds could have gone off course and more attention to these should be given. The golden rule however is that ”if in doubt leave it out” In my years of birding I have found a very small number of birds out of range, so these birds are the absolute exceptions to the rule. If you are however convinced that it is an out of range, do your utmost to get a photograph, even if it is a bad one, as this will be the best proof. Get hold of an experienced birder and show this person what you have found for confirmation, and if it is out of range, report it to Trevor at South African Rare Bird News, so that others may also enjoy your special sighting. Use the abundance descriptors in your book as well to aid our identification. When you are battling to decide on a bird, check up on the status. If the bird is given as common or locally abundant, then you have a very high possibility of being correct. If however the bird is tagged as rare, vagrant (especially if the range map only have a few circles or X on it), take a hard look at your ID and have a look for other alternatives. Although not impossible, but the percentage probability of these birds drastically reduce. The last feature to look out for in this section is habitat. The guides usually have a short line describing the habitat that the bird will be found in. This is also a very important aspect when weighing up different species on an ID. Birds stick to their habitat, as they are geared for feeding, breeding and camouflage in these habitats and moving out of them puts them at risk. Thus convincing yourself of a bird found in grassland, when the habitat describes the bird as a woodland species, will have to lead you to reconsider your options. Thus we must not only look at the visual clues of the bird in question, but couple this with range, status and habitat for effective and accurate identification. But there are the possibilities for exceptions, and these are what makes birding exiting. Just always be pragmatic about your approach and keep a level head. Adverse weather causes birds to temporary change behavior and range, and will lead to some interesting finds, or irruptions of species in mass in unlikely areas, thus the rules are not hard and fast. Enjoy these cases, and never take the chase for rarities to serious.